The Murl Engine is a cross platform framework. All platform dependent implementations are abstracted to ensure the compatibility across different platforms. Different platforms use different C++ compiler. These compilers differ slightly especially in the area of standard libraries and the STL (Standard Template Library). The following sections show how to implement applications with the Murl Engine without using these standard libraries. The best cross platform compatibility is ensured when only interfaces and functions of the Murl headers are used. Of course it is also possible to use other headers/libraries, if in a particular case the framework does not provide a proper implementation for a special feature. In such a case feel free to create a new thread in our forums to discuss possible new features or corrections. The probably most often used container classes in C++ are the classes of the Standard Template Library (STL). Unfortunately these container implementations differ between different compilers especially in regard to the execution speed and in rare cases also in the behavior. Due to this fact the Murl Engine provides adapted NTL container classes - see www.ultimatepp.org. These container classes are very comfortable when you get used to them and provide a considerably faster and more reliable execution time compared to the STL container classes. To improve the performance the memory usage of the NTL is a little bit simpler compared to the STL and does not use the copy constructor for internal memory movements. However, the copy constructor is used when elements are added (e.g. Add(), Insert()). Object containers internally use simple containers to store references to the instances of their elements. Therefore it is never necessary to move the instances itself in the memory. Also external references to these instances remain always valid, which is another advantage of object containers. A detailed example about the differences can be found in the subsection Simple Container vs. Object Container. Of course, the copy constructor is used when elements are copied or added to a container - regardless if a simple container or an object container is used. Only for internal memory movements the usage of copy constructors are avoided. Efficient container classes are very important to achieve a good App performance. This is even more important for multimedia applications on mobile devices. The following sections cover mainly the usage of container classes. The results are simply shown as text output messages in the console window. The header murl_debug_trace.h contains methods to output debug messages. Debug messages are not printed in release builds. The first parameter (0) defines the "log level" for this message. Debug messages are suppressed, if the log level is higher than the global log level. If e.g. the global log level has been set to 1 only debug messages with a log level smaller or equal to 1 are printed. The global log level can be set with the method Debug::Logger::SetLogLevel. The method Debug::Logger::GetLogLevel can be used to read the global log level. It is remarkable that also the method name and the line number are printed in front of the debug message. Debug messages on Android are printed as LogCat messages with the priority ANDROID_LOG_DEBUG. The header murl_debug_error.h contains methods to output error messages. Error messages are also printed in release builds. Again, it is remarkable that also the method name and the line number are printed in front of the error message. Error messages on Android are printed as LogCat messages with the priority ANDROID_LOG_ERROR. The methods IAppConfiguration::SetDebugOutputFunctionVerbosity() and IAppConfiguration::SetDebugTraceLevel() can be used to configure the MURL_TRACE and the MURL_ERROR message output. All methods mentioned above (Console/Debug/Error) are of course also supporting the usage of variables like the well-known printf function. Debug and Error methods automatically add a line break to every message while the System::Console::Print method prints exactly the given text without additional line break. The character \n can be used to create a line break manually. Alternatively the PrintEndline() method can be used but be aware that this method does not support the usage of variables. The C++ programming language does not provide a proper character string class. To compensate for that the class String declared in the header murl_string.h is provided. Contrary to STL Strings, a NTL String always maintains a valid pointer to its character array. The method Begin() can be used to get this pointer (equivalent to c_str() from STL String). In the first case the String object is put onto the stack instead of the null-terminated character array but the print method is expecting a standard C string followed by a integer value which is in the end causing the erroneous output. In the second case the output is correct. Note that single quotes need to be used because this method requires a single character. // text contains now: "XXXX"
// text contains now: "XXXXYYYYY"
// text contains now: "XXXXYYYZZ"
// text contains now: "AXXXXYYYZZ"
// text contains now: "AXBBXXXYYYZZ"
// text contains now: "AXBBXYYYZZ"
All substrings matching with "YY" are replaced with the replace string "CCC". // text contains now: "AXBBXCCCYZZ"
Note that the method returns a new string (no modification of the source string). Note that the method (GetLength()) returns the number of bytes. The number of UTF-8 characters may differ and can be obtained with the method (GetLengthUTF8()). The method returns the index of the substring in the range of 0 .. (GetLength() – 1) or a negative number if the substring does not occur. Optionally the search can be started from a given index in the valid range. Basically the whole Murl Engine framework is solely working with UTF-8 strings. The String class provides some special methods to handle UTF-8 strings. Make sure to set the standard encoding of the editor to UTF-8 in order to be able to enter UTF-8 strings directly in the source code! Note that unfortunately the output of special UTF-8 characters does not work properly in the Windows console (wrong codepage, font). The number of bytes for some UTF-8 characters is bigger than 1. Therefore the number of bytes in a UTF-8 string is not necessarily the same as the number of UTF-8 characters! A String can be converted into a StringArray to allow the manipulation of individual UTF-8 characters. Each UTF-8 character is stored as a separate String element in the Array. Most of the shown String methods also exist with additional parameter sets. A complete list of all methods can be found in the String API reference or directly in the header file murl_string.h. The header file murl_util_string_conversion.h provides several string conversion functions. A detailed description for all methods can be found in the API reference on the String Conversion Functions page. The header file murl_util_string.h provides several helper functions for string operations. A detailed description for all methods can be found in the API reference on the Murl Util String Functions page. The C++ programming language does not provide a proper container array class. To compensate for that the class Array declared in the header murl_array.h is provided. The predefined Array types spare the usage of the "unhandsome" notation with angle brackets (e.g. Array<UInt32>. Note that the iteration through NTL containers is generally index based. Note that it is not possible to remove multiple elements within one loop because the iterator value is off after the removal of an element. One solution for this problem is the usage of an additional Array which contains the indices of the elements which should be removed. Caution! The indices must be sorted in ascending order. The method returns the index of the first occurrence of the specified element in the range of 0 .. (GetLength() – 1) or a negative number if the element does not occur. Optionally the search can be started from a given index in the valid range. The method IsIndexValid() can be used to check if a given index value is valid. Clear() removes all of the elements from this Array and frees all internal allocated memory. Empty() removes all of the elements from this Array but keeps the internal allocated memory for further usage. Using the method Empty() can be considerably faster, if the same Array object is cleared and refilled with new elements several times. The number of Array elements can also be set with SetCount(). The default constructor is used for each element. Caution! No default constructors exist for primitive data types which will cause uninitialized elements (e.g. UInt32Array, FloatArray etc.). The StringArray elements will be initialized with empty Strings by the default constructor provided from the String class. Most of the shown Array methods also exist with additional parameter sets. A complete list of all methods can be found in the Array API reference in the section Murl Container Classes or directly in the header files murl_array.h and murl_object_array.h. As previously mentioned, NTL containers do not use copy constructors for internal memory movements to improve performance. 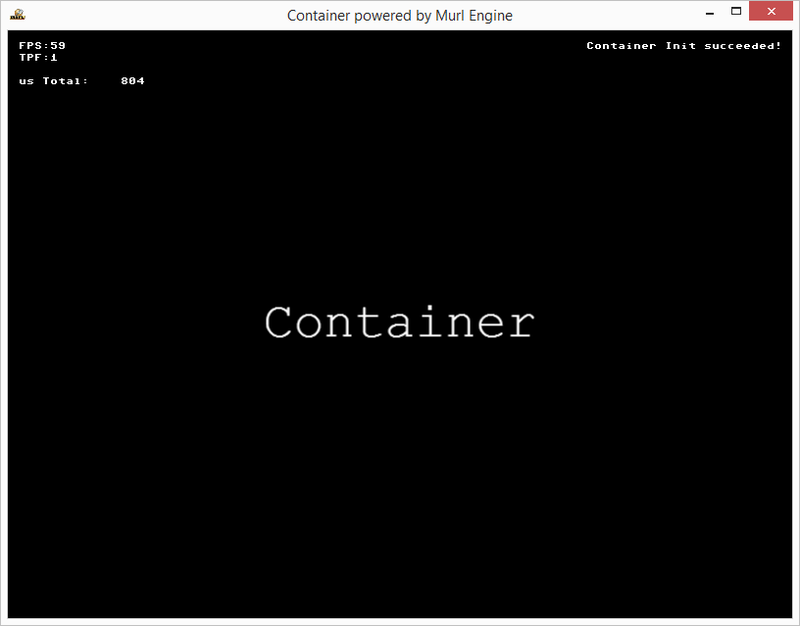 Object containers like the ObjectArray from murl_object_array.h should be used to store big structs and objects. Generally all methods of the Array class are also provided by the ObjectArray class, except for a few. SetCount(3) creates three objects and stores them in the ObjectArray. The method Add(anotherObject) creates a copy of the object anotherObject and stores this copy in the ObjectArray. The method Remove() can be used to remove an object from the ObjectArray and to free the memory of it. The ObjectArray frees the memory for all of its objects automatically when the ObjectArray is destroyed. If the copy constructor of an object is private, the object obviously cannot be added with the above shown method Add(anotherObject). Therefore ObjectArrays support the addition of elements which are directly allocated with "new". The ObjectArray takes the owner ship of the object and frees the memory using "delete" in due course. We create a simple Array arrayNamesA and ObjectArray arrayNamesB and fill both with the same data. In addition we create an object reference objRefA / objRefB and an object copy objCopyA / objCopyB from one element. All variables show the same content but point to different memory regions. As next step we change the array elements located at index position 1 and print again the variable content using Debug::Trace. As expected objRefA and objRefB show the altered values while the variables objCopyA and objCopyB show the "old" values. Memory regions after element change. Now we remove the element located at index position 0 from each array. The reference objRefB points to the correct element in the array. The reference objRefA points still to the element with index position 1 although the correct element now has index position 0 due to the delete operation. Memory regions after element removal. Another advantage of object containers is the usually better performance of delete and insert operations because lesser memory needs to be moved (only the pointers to the elements needs to be moved and not the whole elements itself). An Index container can be used to store and retrieve elements. The container is using a hash algorithm internally to accelerate the search process. Each element is associated with an index value. The classes Index and ObjectIndex are implemented in the header files murl_index.h and murl_object_index.h and utilize the base class IndexBase from murl_index_base.h. The predefined types spare the usage of the "unhandsome" notation with angle brackets (e.g. Index<String>). Classes need to provide a public GetHashValue() method in order to be able to use the class objects as index elements. The method should calculate and return a proper hash value. The Index methods are very similar to the Array methods e.g. Set(), Insert(), Remove(), etc. The methods Find(), FindLast(), FindNext() and FindPrev() can be used to find multiple occurrences of elements. All methods which are containing the term "Put" in their names are only relevant if the method Unlink() is used. The method Unlink() can be used to exclude elements from search operations. A complete list of all methods can be found in the API reference or directly in the header files murl_index_base.h, murl_index.h and murl_object_index.h. As previously mentioned, NTL containers do not use copy constructors for internal memory movements to improve performance. Object containers like the ObjectIndex from murl_object_index.h should be used to store big structs and objects. Generally all methods of the Index class are also provided by the ObjectIndex class, except for a few. The Queue class can be used to create FIFO containers and allow fast adding and removing of elements at the beginning and at the end of a sequence. The classes Queue and ObjectQueue are implemented in the header files murl_queue.h and murl_object_queue.h. As previously mentioned, NTL containers do not use copy constructors for internal memory movements to improve performance. Object containers like the ObjectQueue from murl_object_queue.h should be used to store big structs and objects. Most methods of the Queue class are also provided by the ObjectQueue class. A map object can be used to map a key to one or more elements. The container is using a hash algorithm internally to accelerate the search process. The class Map and ObjectMap are implemented in the header files murl_map.h and murl_object_map.h and utilize the base class MapBase from murl_map_base.h. The above shown approach has the advantage that you can easily react if a key does not exist in the Map. A simpler but also more "dangerous" approach is the use of the method Get(). Caution! In this case the application will stop with an ASSERT if the key does not exist! The Map methods are very similar to the Array / Index methods e.g. Insert(), Remove(), etc. A complete list of all methods can be found in the API reference or directly in the header files murl_map_base.h, murl_map.h and murl_object_map.h. As previously mentioned, NTL containers do not use copy constructors for internal memory movements to improve performance. Object containers like the ObjectMap from murl_object_map.h should be used to store big structs and objects. Generally all methods of the Map class are also provided by the ObjectMap class, except for a few. The Murl Engine provides methods related to the system time in the header file murl_system_time.h. The method GetTickCount() can be used to create System::Time objects that are not affected by changes in the system time-of-day clock. Adjustments of the system time have no effect to this time base. If the system is rebootet, this time base typically is also reset. For relative time measurements in the application this method should be preferred. A complete list of all methods can be found in the API reference (System::Time, System::DateTime) or directly in the header murl_system_time.h. Note that it is also possible to compare and sort System::Time objects; see also next section Sorting. The parameter key is used to assign the BEGIN and END methods to each other. Hence also interleaved calls are possible. The messages are printed in the console window as debug messages or as "error messages" depending on the used methods. Sometimes the logic tick duration (GetCurrentTickDuration()) is used as benchmark value. Please note that the Murl Engine by default is averaging time differences between logic ticks and is using an upper limit of one second for the maximum logic tick duration. The method IAppConfiguration::SetClockAveragingFactor() can be used to change the averaging factor (1 means no averaging). The bounds for the logic tick duration can be adjusted with the method IEngineConfiguration::SetBoundsForLogicTickDuration(). The Murl Engine provides methods to sort data in the header file murl_util_sort.h. To sort other elements it is necessary to implement your own comparison function. In the following example we will implement a simple class to store receipts with a value and a timestamp. To be able to sort an Array of such receipt objects, we need to implement a comparison function which can compare two instances (source1 and source2). We will implement two comparison functions: one to compare the timestamps (CompareTime) and one to compare the values (CompareValue). Null if source1 is equal to source2. Negative if source1 is less than source2. Positive if source1 is greater than source2. Hint: To sort the array in reverse order simply create additional comparison functions with inverted return values. It is also possible to sort data arrays without using the Array container class; see Util::QuickSort(), Util::BubbleSort() and Util::BinarySearch(). A complete list of all methods can be found in the API reference (Sort Functions) or directly in the header file murl_util_sort.h. The Murl Engine provides mathematical functions and constants in murl_math.h, murl_math_types.h and murl_math_limits.h. Euler's number and pi and several multiplied/divided pi values. Conversion coefficients to convert between degree and radiant. Conversion coefficients to convert between metric and inch. The Murl Engine provides further classes to work with vectors, matrices, quaternions etc. A complete list of all math classes can be found in the Math API reference. Some functions return or expect Data objects: e.g. if a file is read or if data is received from the network. The Data class simplifies the handling of raw data and is specified in the header file murl_data.h. Using Data objects avoids in most cases the usage of "unsafe" functions like memcpy(). The Data class is derived from MutableData which on the other hand is derived from ConstData. This hierarchy is useful to define who is providing the data and who has the owner ship of the raw data. The method Util::StaticEmptyData() provides an empty Data object. A complete list of all Data, MutableData and ConstData methods can be found in the Data API reference or in the header file murl_data.h. Usually it is not necessary to use pointers at all when developing Murl Engine applications. The class AutoPointer is defined in the header file murl_auto_pointer.h. To a certain degree an AutoPointer takes the memory management owner ship for an object. If an AutoPointer is destroyed (released), the AutoPointer ensures that also the memory of the object to which it points gets released automatically. Be careful when using AutoPointer: When a pointer is assigned to another pointer also the owner ship is transferred and the source pointer is suddenly 0 after the assignment! As previously mentioned, due to compatibility issues the Murl Engine does not use the C++ library Boost. However, the framework provides the two classes SharedPointer and WeakPointer. The usage is exactly the same as with the Boost library. The SharedPointer class is defined in the header file murl_shared_pointer.h. The WeakPointer class is defined in the header file murl_weak_pointer.h. Like the AutoPointer, a SharedPointer releases automatically the memory of the object to which it points. But - in contrast to the AutoPointer, multiple SharedPointer objects may point to the same object. A reference counter counts the total number of smart pointers for each object. The counter is incremented on pointer assignments and decremented on pointer destructions. When the counter reaches zero the object gets released automatically. A WeakPointer is a pointer to a SharedPointer object which does not prevent the release of the object. The reference counter is not incremented for WeakPointers. You can request a SharedPointer object from the WeakPointer object when needed. If the object has been released already, the returned SharedPointer will be 0. If the object still exists, the reference counter is increased and the returned SharedPointer object points to the object. Further documentation and examples can be found in the documentation of the Boost library (www.boost.org/doc). The following subsections list some useful utility functions. A complete list can be found in the API reference on the pages Murl::Util Functions, Murl::Math Functions and Murl::System::CLib Functions.